The New Media Consortium’s Horizon Report, produced in collaboration with the EDUCAUSE Learning Initiative (ELI), aims to create a strategic planning guide for administrators, technologists, teachers, and other professionals working in the higher education sphere. Now in its fifteenth year, the NMC Horizon Report profiles the six trends, six challenges, and six developments that are considered the most significant for higher education now and in the near future. Separate reports address emerging obstacles and opportunities in K-12 education and museum settings. Not surprisingly, every facet that is addressed by the NMC report is tied, directly or indirectly, to eLearning and digital education. In 2017, the six trends that were cited as the most important for driving technology adoption in higher education included blended learning designs, which encompass both digital and traditional learning styles, and collaborative, peer-to-peer learning, which is increasingly accessible as students and teachers connect via blogs, forums, social media, and other digital channels of communication. These are defined as short-term trends that are influencing education policy and practice now, but will likely become commonplace and accepted within the next two years. 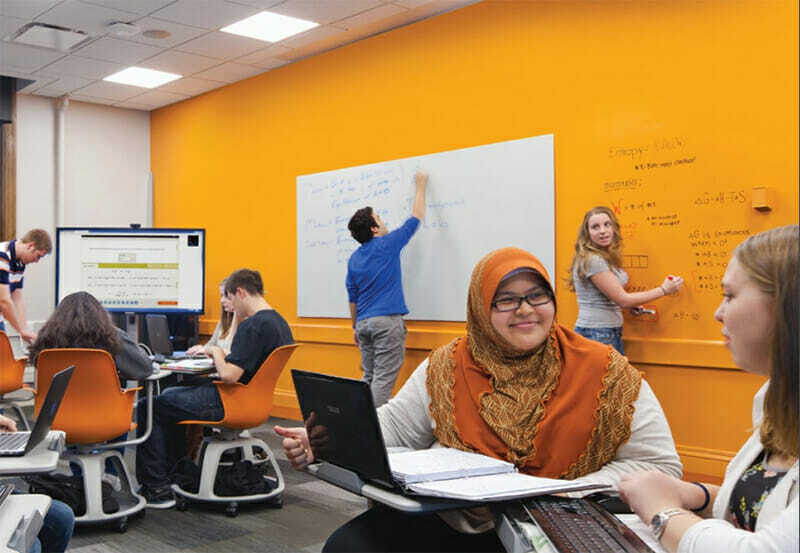 Mid-term trends include a growing focus on measuring learning in meaningful ways and redesigning learning spaces to reflect an environment that is more student-centered and closely integrated with technology. These are trends that are likely to continue influencing the direction of higher education for the next three to five years. The report also highlights the importance of advancing cultures of innovation that will promote university campuses as hubs of creativity, entrepreneurship, and discovery. Another key trend was the development of deeper learning approaches, defined by students’ mastery of critical thinking, problem-solving, collaboration, and self-directed learning. Both of these aspects are profiled as long-term trends which will continue to drive technology adoption in higher education for the next five years and beyond. Among the problems that NMC acknowledges as most solvable is that of improving digital literacy. Educators have noted that a familiarity with social media and other non-educational applications of technology does not necessarily equate to a genuine, adaptable understanding of digital environments. Such an understanding is necessary for students to leverage technology in educational contexts and in the workplace, and to be meaningful contributors and content creators to their field rather than passive media consumers. Another imminently solvable problem is the integration of formal (traditional, classroom-based) learning and informal (curiosity-driven, self-directed) learning, which is likely to improve as instructional design increasingly emphasizes experimental, creative, hands-on learning. Two of the six problems profiled are categorized as difficult, meaning that the intricacies of these challenges were well understood, although the solutions remain elusive. Topics in this category include addressing the achievement gap in enrollment and academic performance among students who vary in socioeconomic status, race, ethnicity, or gender, and the related issue of advancing digital equity in access to high-speed broadband internet and other technological opportunities. The most difficult problems — those that the field has not yet properly defined, let alone addressed — include the management of knowledge obsolescence in the rapidly evolving technological era and rethinking the roles of educators as guides and facilitators in a competency-based, student-driven educational system. The report details six of the most important developments in educational technology that are set to make a significant impact on how higher education students learn. Developments that are expected to be widely adopted by higher education institutions within the next year include mobile learning, defined broadly as the accessibility of learning materials at any time and across multiple devices, and adaptive learning solutions, a concept based on the need for technological tools that can instantly use individual student performance data to tailor course content to reflect that student’s skills and abilities. Over the next two to three years, NMC experts anticipate that the “Internet of Things,” including smart devices that are embedded with processors and are connected to a larger data-gathering network, will be integrated into higher education curricula. Next-generation learning management systems (LMS), also known as Virtual Learning Environments, with higher degrees of flexibility and personalization are likely to be adopted within the same time frame. One of the most notable aspects of the NMC report is that improved artificial intelligence, similar to Alexa and Cortana, and natural user interfaces that rely on voice recognition, facial expressions, and tactile cues are expected to be adopted by higher education institutions within the next four to five years. The 2017 Horizon Report and reports for preceding years are available for free download on the NMC website.